This tutorial provides you with a step by step configuration for a simple Linux server on how to configure server. Linux Fedora core server is chosen for this tutorial, however configuration for other distributions may vary. Fedora is free Linux distribution which is developed by Fedora Project and sponsored by Red Hat. FIAIF is an open source firewall; Firewall let us close or open access to or from specific ports or IP addresses to make our server secure. If we leave all the ports open on the server hackers might use the open ports to attack to the server, so we only keep the ports open which we use, for example we keep port 80 open for apache web server. Details about ports we need to open are in the explanation of FIAIF in this document. Apache is open source software which accepts HTTP (Hypertext Transfer Protocol) requests from clients and response back using web pages such as HTML documents. So if we are going to run a web site, we need to install web server. Browser sends address to the web server; web server sends back the response to the browser and then browser display the content. MySQL is a free database server which provides database access in our server for us which we can use it in our PHP and or other software’s. So if we require in our website to have a database to store information and retrieve, or having dynamic contents such as search pages, members signup and login pages, etc… we will need to install database server. PHP (Hypertext Preprocessor) is a scripting language which is used in the web pages. Using PHP we can have dynamic content in our web pages and also connect to our MySQL database server and load dynamic data from database in our web page. VSFTPD is a free and open source FTP (File Transfer Protocol) server which allows us to upload files to our web server. By configuring FTP server, we can enter username and password and then will be able to download and upload website content in our website. An easy way is to use windows explorer to connect to our FTP server. SendMail let us to send and receive emails in our server. 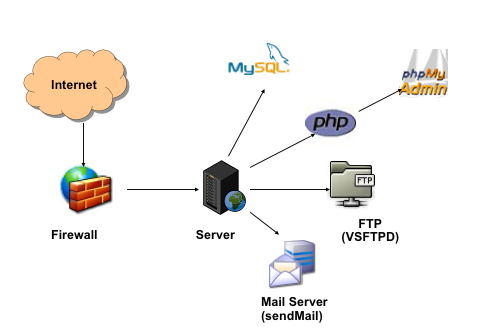 We can use PHP or other scripts to send emails using our mail server as well. Sendmail has SMTP (Send mail transfer protocol) to send emails and POP3 (Post Office Protocol 3) to receive emails. 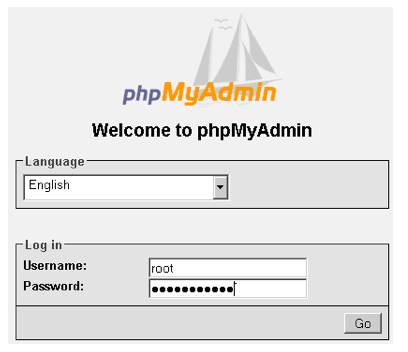 PHPMyAdmin make it easy to connect our MySQL database server and maintain it in a web page interface. We can easily create tables, fields, run reports and queries using phpMyAdmin. You can download tar.gz package from http://www.fiaif.net/download.php page and extract it in your server, after that by using configure & make commands we will compile and install the FIAIF firewall in our server. Using wget command we can download the file from internet to our server, and tar –zxf extracts tar.gz files. # override earlier access information. # First, all Allow directives are evaluated; #at least one must match, or the request is rejected. # Next, all Deny directives are evaluated. # Identifies the log file and the log file format. In the above examples, OldPassword is our current MySQL root password. Once we configured httpd.conf file, we need to restart our web server. VSFTPD is a secure and free FTP server for Linux and Unix. You can download VSFTPD from ftp://vsftpd.beasts.org/users/cevans/ website, in this example, we going to install VSFTPD 2.0.7. Here you can find the commands we need to run to install it, if you going to install it through Yum package manager, it doesn’t need to download it as Yum will download and install it at a glance. To install sendmail from source, first you need to download it. To download it to your website, you can use wget command. This file maps email addreses to the virtual domains and mail boxes. For example we map [email protected] email address to the majid mailbox where we defined earlier in the aliases file. phpMyAdmin is a free software written in PHP which make it possible to manage and handle MySQL related tasks from a website. This entry was posted in Computer Security, Tutorials. Bookmark the permalink.